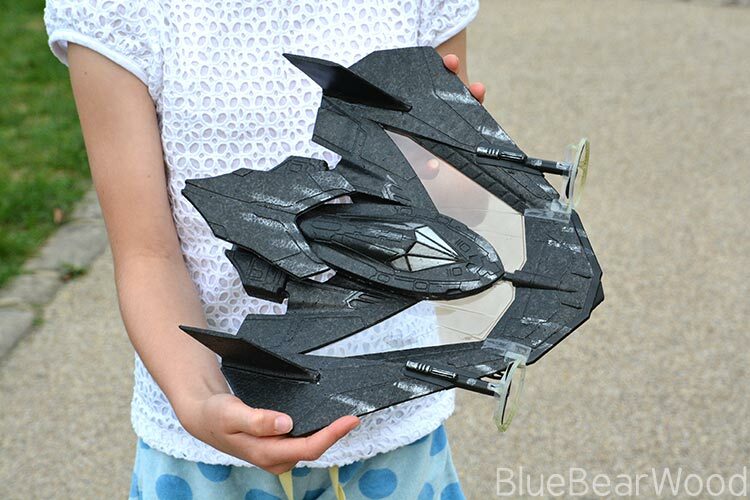 My girls love their superhero films so when the remote control Air Hogs Batwing arrived on our doorstep there was just a little bit of shrieking involved along with a lot of “can I go first, can I go first!”. It’s securely packaged in a sturdy cardboard box with a plastic window that’s perfect for taunting your kids. I say taunting because this awesome flying machine needs a good flat runway plus a large open space to fly in. Your back garden isn’t really going to cut it unless it’s the size of your local play area or park and because it’s made from super light polystyrene you don’t want any wind … this is where your kids learn patience. 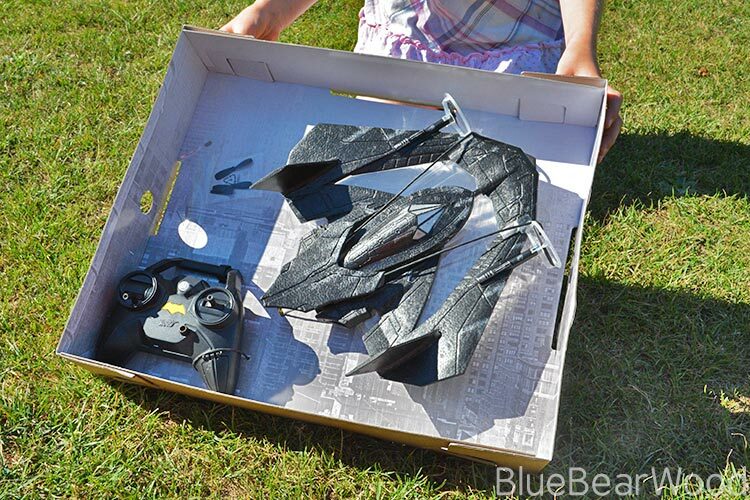 As I mentioned the Batwing is made from polystyrene so there is an element of care required with the handling (it’s aimed at kids aged 8+). Although securely tied in place it’s easy to unpackage. There are a couple of string knots and a couple of plastic bolts that you turn by hand. You will need to buy 6 AA batteries that go inside the remote control (RC) and again no tools are required (I hate it when you have to run arrange searching for a teeny screwdriver). 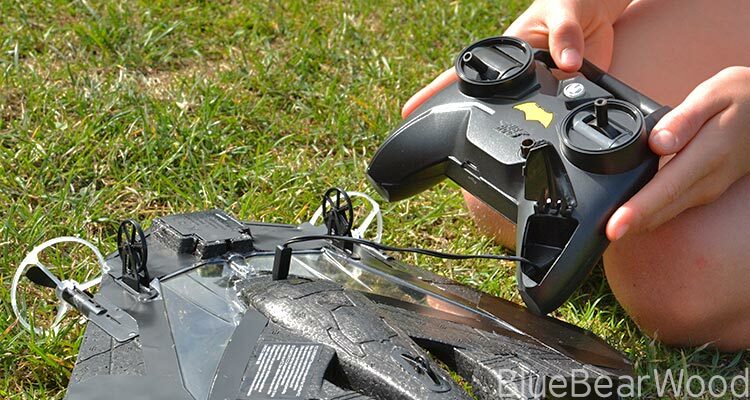 The Air Hogs Batwing can be charged directly from the RC by plugging in a little cable found in a small compartment in the remote control. 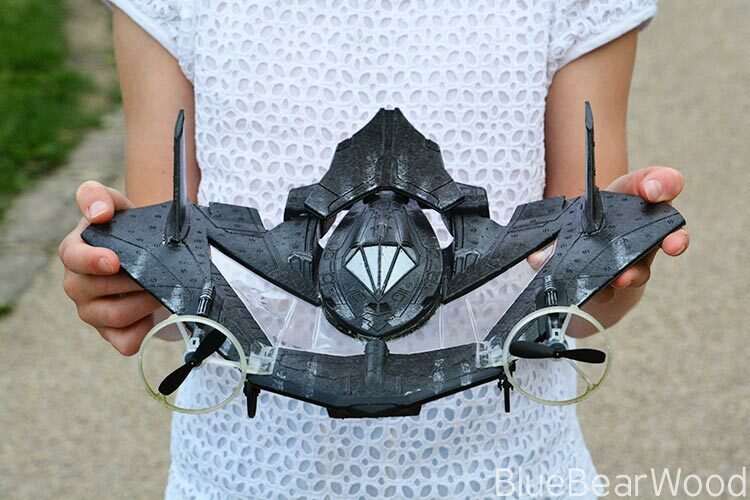 This plugs into the underside of the Batwing. The cable is short but the design is such that the Batwing nestles neatly into the U-shape of the RC while its charging. Another option is to charge via a USB cable attached to you computer, portable charger or even from your car usb charger (the car charge is great as you can charge on the way to the park). The usb cable slots into the front of the RC and as before the cable in the charger slots into the underneath of the Batwing. I found the charge via the car the quickest and most powerful. The first time we used it straight out of the box we had to charge via the RC batteries which was fine and a 15 minute charge gave us enough charger for a few short flights. 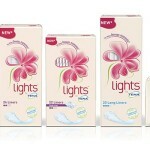 The on/off button will flash whilst charging and stay a solid colour when full charged. Flying the Batwing takes practice. The RC is quite sensitive but only has two main controls … throttle on the left (push forward) and left and right control on the right, plus a small antispin/trim adjuster knob. 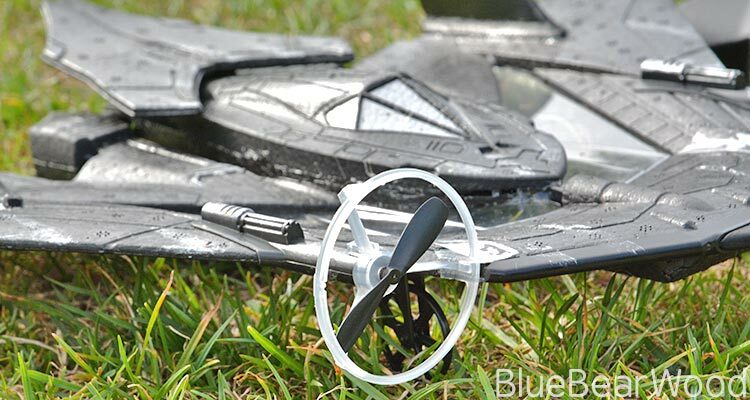 Have a good full charge … the better the charge the more power the Batwing has, the faster the propellers spin and the quicker it takes off. You need a large open space, not full of people as it moves quite quickly and if you’re not in control it could hurt someone. Don’t be heavy handed with the left and right control, small movements can make a big direction change. Keep a reel of clear magic tape (white sellotape that’s not ultra sticky so can be repositioned) with you in case of a bad crash landing. Although the Batwing is tough if you end up nose diving from a massive height (like we did) you can end up with a slight crack. It’s designed well so takes crash landings in it’s stride. 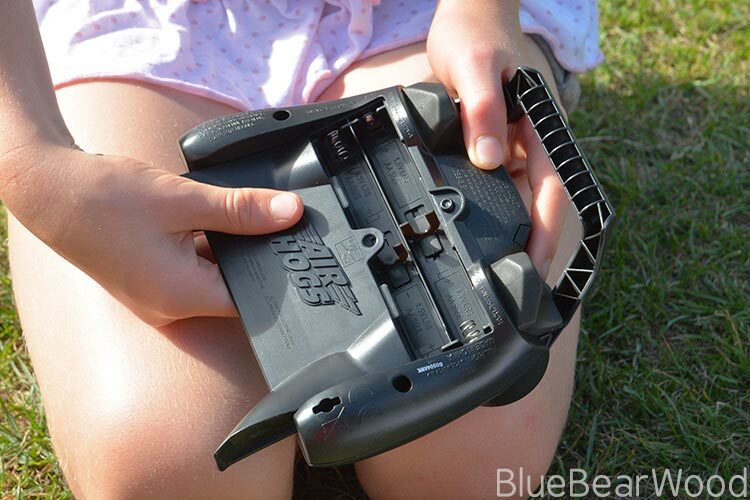 If you find it veers to one side use the small anti-spin/trim adjuster on the remote to rebalance the Batwing. It does take a bit of practice to use and I wouldn’t recommend this for young kids. 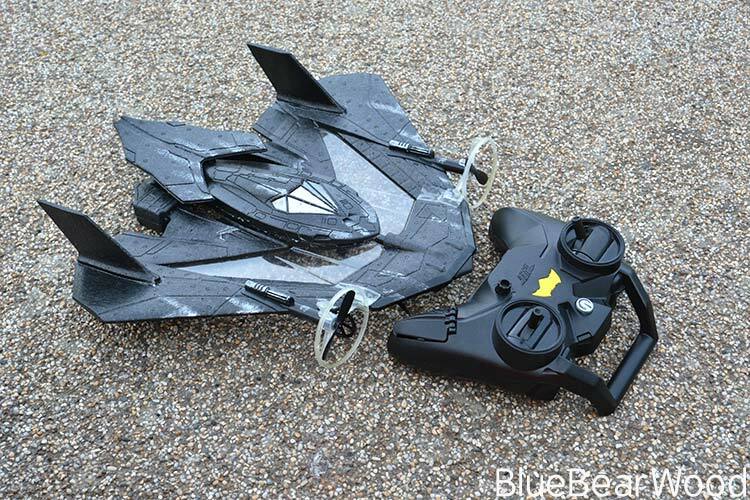 Not only does the Batwing itself need a delicate hand when carrying but it also needs a delicate hand when flying which is why the age rang specified on the product is 8+ years. 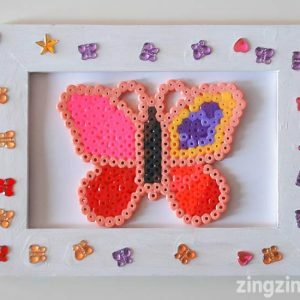 It is loads of fun and great for a whole family morning or afternoon fun. The more you use it the better you get. We managed to get it up flying pretty quickly on our first trip out but it was on a second trip we managed some good height and a little more control … especially with the landing! We love it and although it’s not a cheap toy I don’t think it’s expensive either. 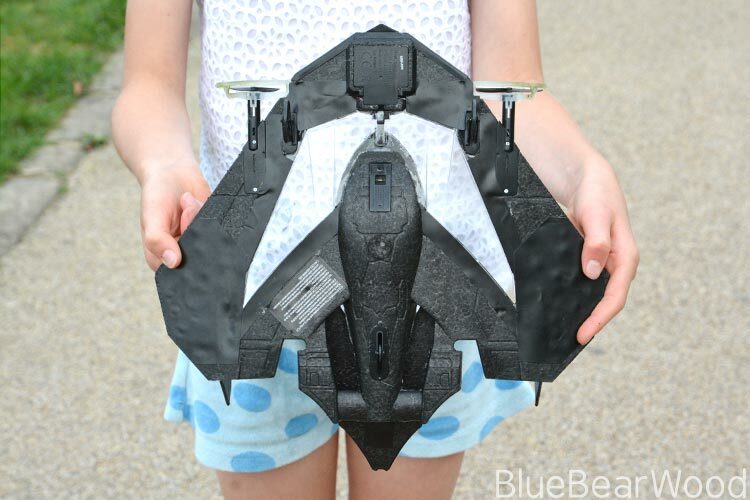 With very little practice you get a fantastic flying RC toy. The only down side is you do need to take it out to a large open area. 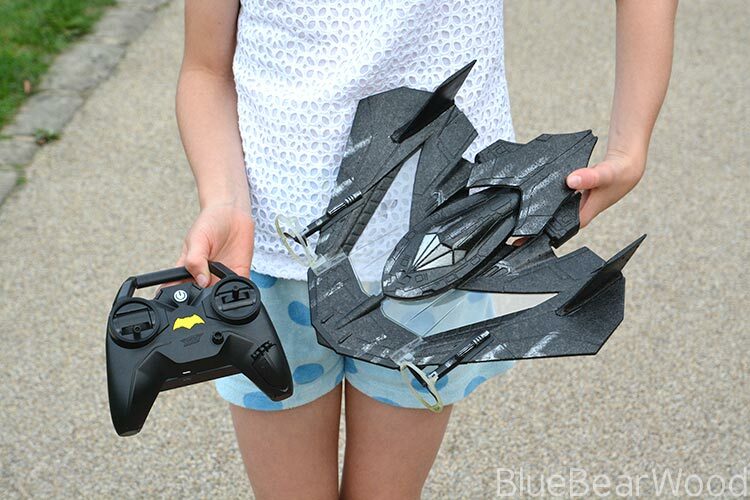 and yes the Air Hogs RC Batwing really is kidtastic fun! I can’t believe it’s made from polystyrene – it looks much more sturdy than that on the photos! But I guess it is light enough to fly well and give the kids hours of fun. The polystyrene is really strong and great at absorbing the energy from impacts plus as you said it’s so light it flies brilliantly. 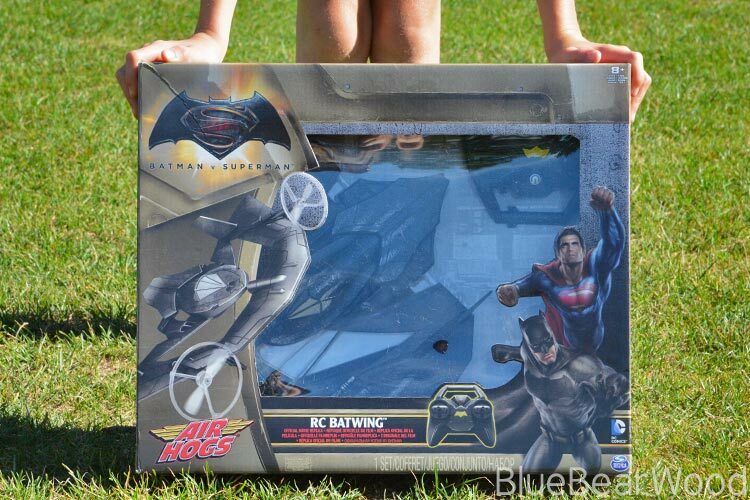 My son would love this as a superhero fan but I think he would have to wrestle it off his Dad! Good you can change the batteries without tools. I find that frustrating too but I know it is for the safety of the children. My kids would love this toy. Wow, this looks like so much fun! In the video it looks like your kids love it! Never mind kids playing on it – I can see my husband wanting this! He such a big kid!! Oh wow! This would be perfect for my nephew for his birthday! Thanks for the inspiration! Wow what a cool looking toy! 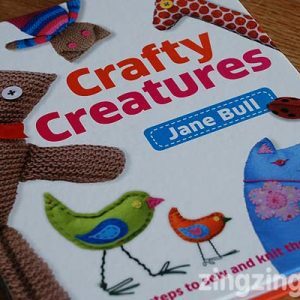 I can imagine every boy aged 8+ (and some a lot older) would love to give this a go – in fact I know a lot of grown ups who would too! 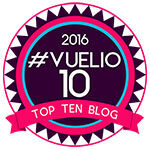 Very very cool! For polystyrene the toy looks super sturdy! Never mind kids, my boyfriend would love one of these. Oh that looks like great fun! My kids are huge DC fans so I know they’d love it. Hello! … Is There Anybody There?